Hello my music & movie compadres. I hope all is well on this beautiful Monday in June. 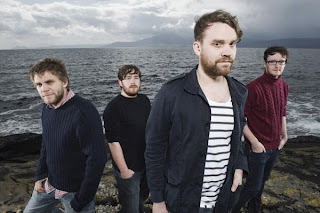 Today I'm giving you a video from a band I've talked about before, the Scottish indie rock band Frightened Rabbit. Over the past three years, these guys have gradually filled my iTunes library and after countless downloads I finally purchased an entire album, vinyl at that. The album, their fourth full length, is called Pedestrian Verse. Like the three previous, it doesn't disappoint with it's typical lyrics of lost love, pain, disappointments and what if's. To be honest, I prefer these guys, to dare I say, Mumford & Sons. It is true. Although I respect and can appreciate the sounds of Mumford, I'm a bit put off by their huge commercial success. Not their fault, just my opinion. I guess that's the music snob in me. To some, Scott Hutchison's heavy Scottish accent can wear, but not me. Ever since, I heard the song 'Keep Yourself Warm', from the album The Midnight Organ Fight I've been hooked. Hopefully you'll like what you hear today from the song 'The Woodpile' and like me you'll take a chance and dive into their older stuff. Have a great week and remember to live your soundtrack out loud. My first exposure (I think - but you, Tiff, or Nick may have told me about them before) to FR was, believe it or not, The Beaver. Yes, the Mel Gibson/Beaver hand puppet movie. "Swim Until You Can't See Land" was featured in a montage sequence and it really stood out to me. Yeah I remember us talking about that after you saw the Beaver movie. Check them out. I'm sure you'll find some more to like.